An Edinburgh Napier student who turned to surfing as an escape from a difficult time at secondary school has commenced the next chapter of his surfing career with a world first PhD. Jamie Marshall – from Innerwick in East Lothian – first picked up a surfboard when he was 14-years-old. It was during school that Jamie found that surfing helped provide an escape from his own anxiety related to feelings of not fitting in and dealing with bullying. Planning his next surfing trip gave him something to look forward to and he immediately fell in love with the sport. This love for all things surf continued throughout his studies at university and he began working summer seasons as a surf instructor on Fistral Beach in Newquay. It was here that he became aware of the work of Wave Project – a UK-based surf therapy programme working alongside young people facing mental health challenges. He subsequently founded the Scottish arm of Wave Project in Dunbar and over the next five years transformed it from an initial pilot with 20 young people, to working alongside more than 100 young people a year in partnership with the NHS’s Child and Adolescent Mental Health Services (CAMHS). 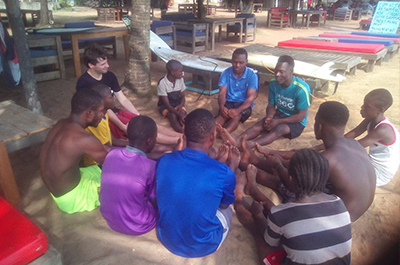 After obtaining a Masters degree in Physical Activity for Health at the University of Edinburgh, he has recently handed over the reins of Wave Project and embarked on studying for a world-first PhD in Surf Therapy. Studying at Edinburgh Napier Univeristy, in collaboration with the University of New South Wales, Jamie’s PhD will seek to understand the theory behind a range of organisations around the world using surfing to combat challenges associated with mental health, disability, poverty and adverse environments. Funded by Edinburgh Napier, a range of industry support is also backing the research project, with principle partners including the International Surf Therapy Organisation and Wavegarden Scotland, the pioneers behind the world’s first cold water wave pool coming to Edinburgh in 2020. Future collaboration within artificial waves offers the potential to take surf therapy research to the next level. For Jamie, the chance to use his own experiences and knowledge of surf therapy to help change the lives of others is a big driver behind the entire project. He said: “I fell in love with surfing the first time I tried it age 14 which was also a pretty difficult time for me at school due to bullying. Surfing provided a bit of an escape for me but I also identified as a surfer from that point on and that was something no one could take away from me. In some ways, this probably made my career path inevitable! “Scotland now has a history of excellence regarding surf therapy and I’m delighted to have played a part in the success that the Wave Project has had here in this country, working with vulnerable young people across Edinburgh and the Lothians. 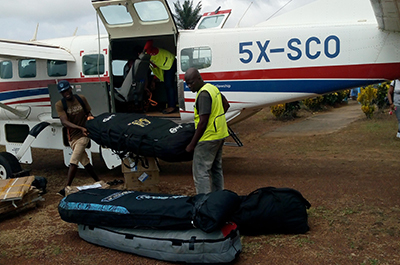 Jamie’s research has recently taken him to Liberia in West Africa where he will be based for three months. 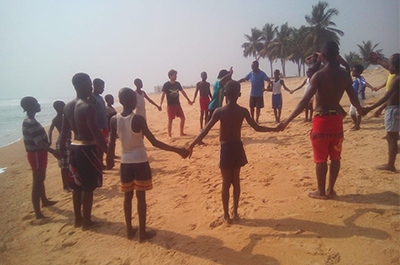 Working with Waves for Change – a global pioneer in the delivery of surf therapy within post-conflict settings – Jamie will assess the impact the organisation’s work has on young people affected by trauma associated with poverty, the 2015 Ebola epidemic and the legacy of civil war. Jamie added: “I actually met Tim Connibear, the founder of Waves for Change, a decade ago on a surf trip to South Africa. I honestly believe seeing the programme at its embryonic stage planted a seed that had led my entire professional life being focused around surf therapy. “When I was looking for sites for my PhD research, Liberia was one of my top priorities due to its unique context – and not to mention amazing waves! Tim and the whole Waves for Change team were very keen to support. To document his PhD, Jamie has launched The Stoked Research Surf Therapy Podcast in which he will feature interviews and news with key figures within the surf therapy community. More information on Jamie’s research can be found here or you can follow his latest updates through his Instagram page @stokedresearch. Header image courtesy of Ken Pagliaro.